Well I thought that I would share this with eveyone. Recently one of my customers nominated me for this feature in the local newspaper. The article came out in this Wednesdays paper and in the 2 days since it came out the web site has been getting a lot of hits and I have had a few inquiry from potential customers. That's some great press Steve, Congrats! We also got to know a lot more about Steve, which is cool. I wasn't aware that you were not "over the hump" as you put it. I'm sure you are happy (I know I am) that your raunt is mobile and you are not tied down to a fixed location with high overhead in today's economy? I know you had previously looked into that in the DC area. Great Job Steve! All your friends at Swinebucks BBQ are pulling for you. Wow, Congrats to chef_hog and family.Great job on your nomination and the potential customers . Free advertising is the best advertising. Word of Mouth is next. That's awesome Steve. A write-up in the local press is never a bad thing. Nice pic too!!!! Saturday we were rained out with heavy rain storms. Sunday we did double the customers and double the sales 42 customers with a check average of $15. We ended the day sell out of everything but about 1.5 pounds of Brisket and 3 portions of Brunswick stew. All in all a great day. Over half the customers were new customers that saw the article and said they had to come and try us out, and the regulars said they loved the article because it gave them a look into what I was all about and they were impressed. I even had a few people approach me when I was at BJ's on Saturday that asked if I was the BBQ guy and that they would be by to try us out. (kinda felt like I was a celeb. LOL). BBQman yea it been steady with new customers every week but because at the begining we were set back more from the road alot of people missed us and with the captial funds being tight we were only able to do a minimal amount of advertizing. In looking at the expenses I figured that the breakeven would be 40 customers a day that we were working but we kept at an average of 20-25 a day from July. Thanks so much for keeping us updated Steve. I always enjoy seeing "how it works" for others. We may try doing something similar in the near future, so I appreciate getting some insight as to how things are working out. I too really enjoyed the article from the human interest story, and I'm sure it will help your business grow. Other than word of mouth, good press is the best advertising you can get (and the price is right too!). Best of luck to you, and happy cooking! My wife threw me a surprise 40th b-day party last weekend, ordered all of the food for the party from you, and had my neighbor pick it up so I wouldn't be tipped off. Everything was perfect. My wife and daughter enjoyed seeing the inside of the trailer. Glad to hear that business is going well for you. I'll keep passing the word. Mrp116 it was great to meet your wife and daughter she was very excited to be doing this for your birthday and having it be a suprise for you. I'm glad that you enjoyed everything. jjsinglespeed I'll be glad if the trend keeps going from the article and business continues to build. The trailer is still working out great and running like a top, no problems so far. Though right now with the cold weather approaching I'm trying to figure out what to do about keeping the inside of the trailer so what warm when its not in use during the week so the water tank, and hot water heater do not freeze. I have been play with the idea of running a portable heater on low just to keep the temp in the 50 degree range so the water does not freeze. The other thought that I had last night is to just leave the polite lights lite and see if that will do the trick it should not use that much in gas over the week and may keep thing just at that 50 degree temp. There are times that I wish I could just make the jump to doing the BBQ stuff all the time but I know that I have to be patient. What have you got for electricity? I would consider a het-tape and insulation to keep tings from freezing, but then you would also need to worry about the P-traps. Maybe a splash of RV antifreeze down the drains to keep te traps from cracking?? This is a slow time for me too, Everyone in this area is slow though. any local events coming up that may help? Though right now with the cold weather approaching I'm trying to figure out what to do about keeping the inside of the trailer so what warm when its not in use during the week so the water tank, and hot water heater do not freeze. Well the leaving the polite light lite has done the trick during the last couple of weeks with temp going into the 30's and 20's the inside of the trailer has been at around 50 degrees. The waste water tank in not a concern at this point because I do empty the tank in the evening so there is no water to freeze. customer counts have come down to 30 each of the days since the article and I'm still seeing new faces. Harry at the storage location I don't have electric because this is a trucking company and I cann't run a cord on the ground because it would get torn up with the trucks going over it all the time. So for now it will be the polites lights. 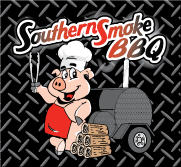 Well, I was driving last Thursday from Fredericksburg to Charlottesville and I was intrigued by the "Southern Smoked" sign followed quickly by the familiar Chef Hog sign from your avatar. Sorry I happened to be in town on a day you weren't open. I would have tried one of everything (I'm so thankful for the expense account). Sorry I missed you Poppa but you know how it is right now I have to have the Day Job. I end up leaveing the signs up all the time now because it easier then putting them up every weekend. It also let people know that we set up there. I'm planning on getting a new banner that says Open Saturday and Sunday just to make it clear. Still getting new customers every week now I just need to get them to come all at once. But we are still hanging in there.